This tab is focused on helping men find tools for their Self-Care because Herbal Remedies are important in balancing male health. Even though I'm a woman, I get it! We all need to take time out and prioritize our personal needs. In Blog Posts, your *M in the Key for Self-Care Groups. If you are a papa, you definitely deserve time to take care of yourself, too. Many men push themselves way too hard. Sometimes, they neglect to listen to their bodies' messages. Have you felt that before? You know, when you go to cut that next piece of wood and your back is screaming STOP, but you keep going because your house needs to be warm. Or when you come home from a long, hard day's work so hard and you just want to relax, but family life is begging for you to play or worse yet, take the trash out! My passion for discovering what lies inside of flowers, plants, roots, and barks still burns strongly today. 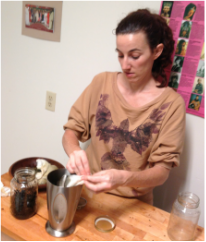 I joyfully make medicine to nurture the body, mind, emotions, and spirit. Please, enjoy journeying through my site and exploring what I have to offer. Below are two buttons that link you to Rainforest Remedy Herbal Tinctures and Herbal Body Care Products that are just for men. If you have any questions or comments don't hesitate to connect with me via email. Thank you for stopping by and taking time to learn about natural ways to take care of yourself.